You’ve seen books from the Images of America series thousands of times at your local bookstore, airport, historic landmark gift shop, etc. (there are over 5,000 titles in the series already). They are paperback books chock-full of black and white pictures of historic towns, neighborhoods and fraternal organizations. The Burger Chef book is the first one dedicated to a fast food outlet and for sheer historical and pop culture value, the chain is a great choice for this treatment. First time author Scott R. Sanders uses images he has gathered from Burger Chef co-founder Frank P. Thomas Jr. (who sadly passed on before the book was published*), several collectors and perhaps the largest collection of Burger Chef memorabilia, Schroeder’s Drive-In in Danville, Illinois, to move along the pretty compelling story of the chain. Running almost parallel to McDonalds (in philosophy, McD’s set up shop in the big towns and Burger Chef ruled small town America), the chain was a trailblazer in fast food technology and marketing and at one point laid claim to the title of fastest growing fast food chain in the country (and second-largest chain overall behind McDonalds). As much as I wanted Stacy Perman’s In-N-Out Burger book from earlier this year to be some sort of cosmic event – offering up the secrets to success and worldwide burger adulation with a side order of history, Sanders builds a story here that I think is much more compelling. In less space and really only with pictures, he illustrates Burger Chef’s impact on the industry and in reshaping small town America (now whether that is a good thing is debatable, but with chains that have disappeared we can cut them some slack). The incredibly personal and candid photos used throughout stamp a real time and place aspect on the story, which ratchets up the nostalgia factor while easing you through the history. Broken up into 6 sections, the book takes you from the birth of the franchise (like McDonalds, Burger Chef was born out of the technology that was used in the restaurant – in this case the Sani-Shake and Sani-Broiler designed by chain founders under the General Equipment Company flag), through its growth and ultimate demise, with stops along the way to gawk at store merchandising, promotional items and advertisements. One of the most interesting sections of the book is about an ill-fated side venture from Burger Chef, the Pied Piper mobile food van. As shown below, the entire operation was run out of an early 60’s Volkswagen Van. I had the chance to speak with Scott about some topics not covered in the book. The last Burger Chef closed in 1996, is there chain today making burgers similar to BC? The hamburgers at Carl’s Jr. are flame-broiled and taste the closest to what I used to eat at Burger Chef. Burger King used to taste similar, but the flavor of their hamburgers has changed. I don’t think I ate hamburgers more frequently while writing the book, but I was often reminded of how much I missed eating hamburgers at Burger Chef. Actually, I did a presentation about Burger Chef and my book for my school last spring, and the reaction of the students was amazing. They were fascinated by the story of the chain and they all wanted to go out and eat at one of the restaurants. I (Scott) generally consider Whataburger to be the best hamburger chain in the area. I (Scott) have started eating at a new chain called Mooyah that just opened here. To order, you fill out a card indicating your choice of hamburger and the toppings you would like. Burger Chef is available at area bookstores, independent retailers, and on-line retailers, or through Arcadia Publishing at (888)-313-2665 or www.arcadiapublishing.com. Disclosure: I received a review copy of this book at my request. 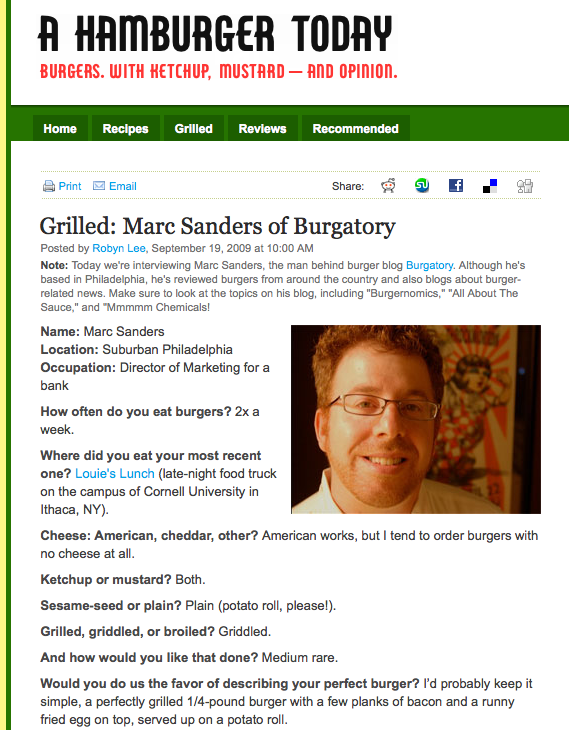 I receive no compensation for your purchase and I am not related to Scott R. Sanders, but it is good to know there are other folks named Sanders who appreciate a good story and a burger. This sounds like a really interesting book, I’m going to have to check it out. I grew up in a small Midwestern town and went to Burger Chef quite a lot as a kid until it became a Hardee’s. The Fun Meal was a big selling point. I worked for Burger Chef for about 12 years, from the late ’60’s until the late ’70’s. I’m getting a copy of this book, as it should be really interesting. I might even see some people and places that I would recognize.